PHOENIX — The Arizona Department of Transportation will begin a pavement improvement project Monday along Interstate 15 that will resurface a 13-mile segment east of Mesquite, Nevada. When this work is completed in summer 2016, ADOT will have repaved the entire 29-mile-long Arizona corridor of I-15 in the last three years to provide a smoother surface for motorists. In 2013, ADOT finished an $11.6 million project to repave the stretch from the Virgin River Gorge to the Utah line (mileposts 13-29). The new $10.4 million project will cover the segment from the Nevada line to the Virgin River Gorge (mileposts 1-13) and will also include improvements to the I-15 Littlefield Bridge at milepost 8. To minimize travel delays, most of the paving work will take place overnight between 6 p.m. and 6 a.m. Monday through Friday. Crews will begin working in the southbound lanes at Exit 8 (Littlefield). Motorists should expect brief delays while traveling through the work zone. 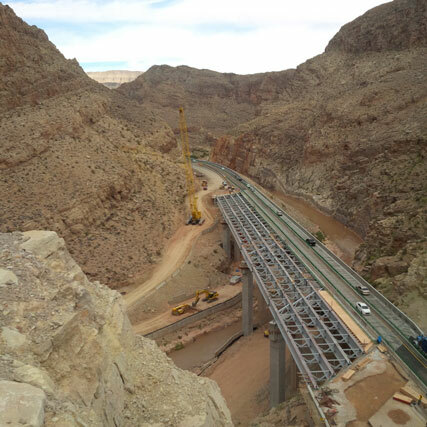 Motorists should plan for additional travel delays while ADOT continues a major reconstruction of the Virgin River Bridge No. 6 (milepost 16), midway between Mesquite, Nevada, and St. George, Utah. The highway is narrowed to one lane in each direction through the work zone until the project is completed in summer 2016. This $27 million project will replace the bridge’s superstructure (girders, deck and railings), as well as widen the roadway through the gorge. With limited alternate routes through this corridor, drivers should plan ahead, allow extra travel time, slow down, drive carefully through the work zone and be alert for construction equipment and personnel. To stay up to date with the latest highway conditions around the state, visit the ADOT Traveler Information Center or call 511; outside of Arizona dial 1.888.411.ROAD (7623). For more information about the I-15 Virgin River Bridge projects, go online.